In this diagram, the entire body is depicted to demonstrate whole body ideal posture. I like using this diagram because it expands on the previous and also demonstrates frontal plane postural symmetry. In this discussion, it is helpful to remember we are not completely symmetric creatures - it is natural and normal to have one shoulder slightly elevated or one hand slightly larger than the other. 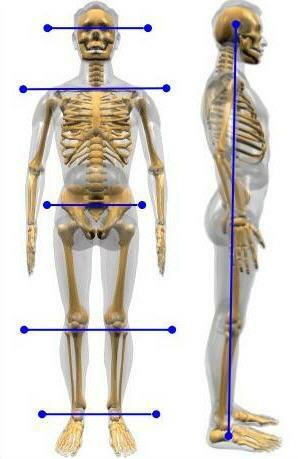 However, frontal plane posture should be reasonably symmetrical. The second half of this diagram once again depicts sagittal posture which is the more interesting of the two. Stomach In: Tightening the abdominals is an important aspect of spine health as it causes a co-contraction of the core muscles as a whole. This includes the very important interspinous muscles which form a type of tri-weave around the spine to create a strong stable structure. Pelvic at Neutral Rotation: For most people the pelvis is anteriorly rotated where the abdominals are stretched, the buttocks are raised, and the curvature of the low back is accentuated. This is typically due to tight hip flexors, tight low back paraspinal muscles, weak gluteals, and weak abdominals. As the pelvis and hips are the foundation of the core, this is a key aspect I look for in my patients and clients. Hip at neutral rotation: Recent scientific literature has suggested that the hips are the most important link of the lower extremities. From a biomechanics perspective, this makes perfect sense. The orientation of the hips act as a guide-wire for all of the other muscles below which then must respond to reaction forces during weight bearing activities. To find your position of neutral hip rotation, feel for a boney prominence called the “greater trochanter” which lies on the side of your upper thigh at the level of the lower pelvis. Turn your leg in and out and you will feel the boney prominence reveal itself through the musculature. When the greater trochanter is pointing to your side and away from you, you have just found the neutral rotation of your hip. Knee’s in-line: The knee is known as the unlucky cousin of the hip and ankle. As it is sandwiched between the anchor point of the lower extremity to the core and the weight bearing structure of the ankle/foot, the knee received and absorbs the majority of stress forces during movement and function. For women, this is especially true since women have a slightly wider pelvic girdle than men predisposing women to a genu valgum (“knock kneed”) posture. The Kettlebell Therapy solution to this will be discussed in future posts. Knee and Shin at Neutral Rotation: It is important that the knee and shin are held at neutral rotation as well. Excessively rotated joints in this region can cause undue stresses which result in knee pain, ankle/foot pain, hip pain, and even back pain. You can generally achieve neutral rotation at the knee and shin by finding the crest of the tibia (the long thin boney prominence in the front of your shin) and pointing it forward. Don’t trust your knee caps as a sign of knee rotation as it can be pulled out of alignment by poor muscular balance. Ankle and Foot Forward: To achieve ideal ankle/foot position, you can generally point your feet forward so that the boney prominence on the outside of your ankles (lateral malleolus) are pointing to your side and aware from you. As practitioners of choice in regards to movement, function, and health amongst allied healthcare professionals, Doctors of Physical Therapy undergo the better part of 3 years of graduate school, clinical affiliations, internships, and residencies to fully appreciate postural and movement deviations. Therefore, we’ll hold the discussion of ideal posture to these points for the time being and re-focus on the application of the Functional Wall Squat. Coming up: Breaking Down The Functional Wall Squat (Part 4). In my next post, I will integrate ideal posture with the dynamic movement of the Functional Wall Squat (FWS) and discuss the FWS as a functional assessment.